Balanced and fast, the new Makita DUC353 36 volt 14″ cordless chainsaw features a direct-drive brushless motor and a maximum chain speed of 3,940 feet per minute, matching the output of a 30 cc gas-powered chainsaw. The DUC353 is built for professionals—landscapers, arborists, etc.—and is loaded with features that make it safe, efficient and dependable. Check out kmstools.com or the latest flyer for an outstanding price on this shiny new cordless chainsaw. 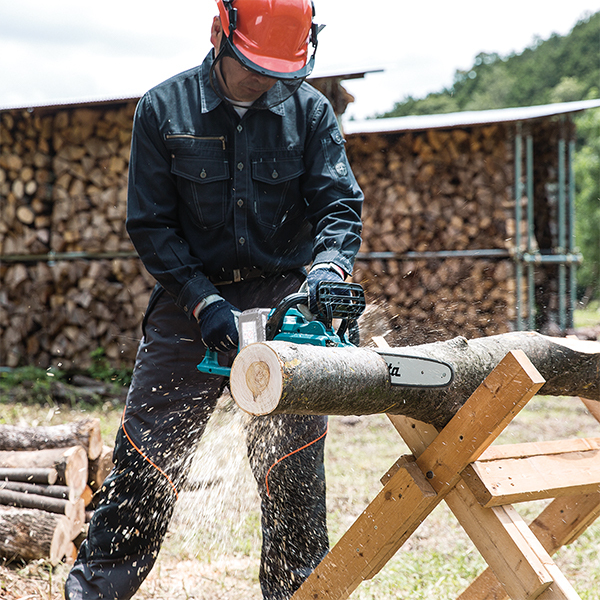 The DUC353 operates at 100 dB, which is quieter than a comparable gas-powered chainsaw. Plus it runs clean, creating zero emissions. Its outer rotor brushless motor and constant speed control ensure consistent rotation speed when you’re cutting and lower noise levels when you’re not. 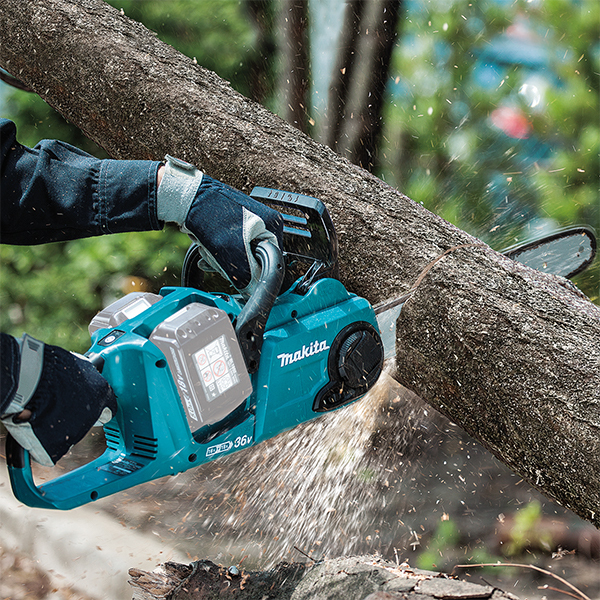 The chainsaw also features a slim, compact design, and weighs 11.5 lbs with batteries. That’s lighter than a similar gas-powered saw with a full tank of fuel. Makita has positioned the batteries between the handle and motor, so the DUC353 is balanced and easy to control. Its variable-speed trigger switch, tool-free chain tensioning and front hand guard–activated chain brake help this cordless chainsaw feel and perform like a traditional gas-powered model. 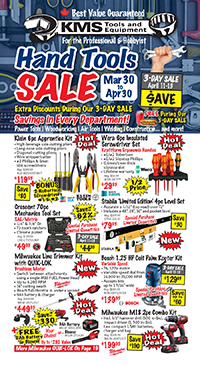 This entry was posted in Archives, Cordless Tools, New Tools, Outdoor Power Equipment, Power Tools and tagged cordless tools, Makita, new tools, Power Tools by Your Friends in the Tool Business. Bookmark the permalink.